We recently spoke with Mr. Raj Kumar Rishi, Director – Inkjet & Web Solutions and Consumer Business, Hewlett-Packard India, about the latest printing trends in consumer segment, and were not only enlightened about what the masses want, but also, about how HP tries to give it to them, and a range of HP printers. To start off, Mr. Rishi described how there is a major market overlap between SMB and consumer segments for higher end inkjet printers. While this may seem a bit contradictory at first, it’s absolutely natural, where a small business or start-up would invest in an inkjet solution for their daily needs, instead of a laser printing solution. Mr. Rishi also explained that while much of printing is done away with in the present days of email and the internet, the amount of information has gone up substantially, in fact increasing the total volume of printed mater. The trend of migrating from single function printers to multi-function printers has been steadily increasing, with consumers realising the value of money they offer, apart from complete solutions right at home. HP has noticed that, whether or not consumers print colour on a daily basis, they would want a colour printer, just on the off chance that they might require it. This is why HP offers colour printers starting from a very low price, to cater to every possible user. There is a gradually growing demand for wireless capable printers, some of which provide remote printing, Bluetooth and WiFi printing options, and others, are complete web-enabled printers, which don’t need a computer at all to download and print your images and documents. This is where sites like HP’s Snapfish are great tools, which apart from sharing and customization options, allow users to print photos directly, without requiring a PC. With a PC connected however, you can also perform selective printing, where you can choose exactly what you want to print on a website or document, and print only that. This is a very fast evolving segment, and you can expect new types of web-enabled printers every 6 months. User interface was always important, and instead cluttering the printer with tens of buttons, HP has started providing consumers with touch screen printers, which enables the user to access many functions and manage settings in a more intuitive manner. According to HP, things have changed since 2009, when the world economy really suffered. Consumers have become very knowledgeable about their requirements since, and think hard about which printer is best suited to their needs. This means that consumers have now begun to think about the total cost of ownership, which includes the running cost, instead of just the initial cost of the printer. HP’s range of multi-function or All-in-One devices, which range from 3-in-1, to 4-in-1, and 5-in-1 devices the last of which includes a printer, scanner, photocopier, fax, and phone. When asked about the variety of cartridges on offer, HP’s Raj Kumar Rishi also spoke to Digit about their Best Choice Portfolio, which contains 4 different types of cartridges in one pack, where the user can choose from such options as with Standard B/W, Everyday B/W, Combo Pack Colour & Mono, and XL size cartridges, depending on their usage, and offers options for all, low, moderate and high volume printing. Here the cost of cartridge is calculated as the cost per page with that cartridge. With the HP Deskjet Ink Advantage Printer - K109a, which costs approximately 7K, customers will get the very best of HP’s cartridge consumption technology, called Ink Advantage, which can offer cost per page as low as 72 paise. Apart from saving up to 15% in the cost of the cartridges, the Best Choice Portfolio attempts to minimize the hidden costs for the user, including those related to ink and paper wastage are avoided, all while maintaining output quality and consistency. The user can switch cartridges as per there intended usage, for example, a colour cartridge for photos, Everyday B/W for draft quality prints, and Standard B/W for full quality. The Best Choice Portfolio is available for Office 6000/6500/8000/8500 series printers. 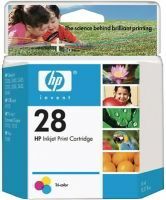 The only thing HP stands against completely is counterfeit HP cartridges, where customers are cheated into buying HP-branded cartridges at the same price, and get much lower quality in return. To avoid this, HP has brought out many measures, such as original holograms on the packaging, home delivery of cartridges with a toll-free Dial-a-Cartridge number (available across 80 cities, where the customer gets a cartridge within 4 hours), a loyalty program called Most Valuable Customer, and Original Cartridge Stores. After hearing about the Best Choice Portfolio, we were curious about the types of inks being offered, and how that technology was progressing. Mr. Rishi replied by saying that ink is definitely developing, and while he is not a technology person, he can tell us the strategy behind the development, which is to better the print quality, and reduce the cost per page. The HP Deskjet Ink Advantage Printer - K109a is one such example, of ultra-low-cost printing. Hearing HP’s stance on refills and third-party cartridges really intrigued, “just like any other competition”, and so we just had to ask this question: Why doesn’t HP consider making cartridges that are refillable, where an HP licensed store could refill original ink for the customer. While the initial cost might go up, the running cost will almost definitely go down. Mr. Rishi responded by saying that he wasn’t aware of any such developments at HP, and that is chiefly because HP’s aim is to reduce the total cost of ownership. He went on to reemphasize the ultra-low cost (72 paise per page) of the HP Deskjet Ink Advantage Printer - K109a, which can be found nowhere else. He did say that this a slightly more expensive printer, but is useful only for those who are into moderate to large amounts of printing, and others, can go ahead for even more inexpensive single function device. He maintained that refills are definitely up to the customer, but HP’s aim is to provide the best print quality combined with lowest possible cost for the user. After hearing about Snapfish, and web-based printers, we were eager to hear more about cloud-printing, and a possible HP cloud-based document sharing solution, such as Google Docs. We were told HP is most interested in cloud-printing, and that there is a lot of development going into it, but no specifics can be revealed as of now. How to plant an article about my mobile app on Digit? Certus Technologies, has recently launched eKAVACH. I would like to know more about this application?